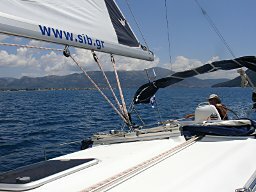 This is the story of Neil and Yvonne Armitage, a couple of New Zealanders in their sixties who, in May and June 2009 broke from their own conventions to experience a six week sailing adventure in Greece. The dream became a reality. This is the second part of the logbook that describes this adventure. Click on the thumbnails to see a larger 800x600 photo in a new window. Now back in the Northern Ionian we began to thread our way northwards through the Inland Sea near Lefkas. Firstly a wonderful 2 and a half hours of sailing to Killini, a rather desolate town but a major ferry terminal for Zakinthos - Zante and Cefalonia - Kefalonia. Then north to Poros, a slow drifter of a day, most of which was spent motoring. Here we rejoined the fleets of flotilla charter yachts that dominate the quays and clog the harbours of the Inland Sea. Not that we should begrudge them as we too have enjoyed flotilla sailing but now as independent charters we see it from a different view. 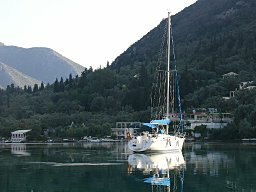 For 14 days after leaving Fiskardo we had enjoyed the peace of un-congested ports well off the busy flotilla charter routes. A lively pod of dolphins played around the yacht. 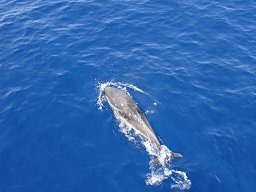 One of 3 visits by dolphins during our 6-week cruise. Poros to Sami was another drifter of a day where we ended up joining a line of yachts motoring into port. Leaving Sami we motored out across the Vathi Channel into a good breeze that eased off once we were south of the island of Ithaca but still gave us good sailing across to the Echinades islands where we then motored east of Nisi Dragonera up to the head of the large bay and the town of Astakos; a busy port quite un-molested by the tourist yacht traffic. Another good sail back across the Inland Sea brought us to Vathi, a secluded town at the head of a deep inlet on the Island of Ithaca. Vathi was very picturesque, surprisingly flotilla free on this day and moored as we were on the north quay sheltered from the northerly. The exercise walking to town and up the hill to the Nymph Cave – an old look out tower was enjoyable. Killini to Poros, a slow drifter of a day most of which we spent motoring. 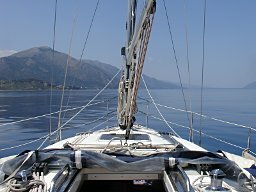 Light winds and short distances make the Ionian Sea ideal for inexperienced bareboat sailing holidays and flotillas. Assisted bareboat is a mix between a proper bareboat and a proper flotilla sail. A thunderstorm and heavy down pour delayed us leaving Vathi until after lunch. When we did get away we had a 3 and a half hour motor back across the Inland sea to Kastos. A small harbour and a rather sparse village with 3 tavernas and one shop were the centrepiece of the island. Narrow roads boarded by old stone fences lead out from the village into the countryside. Tucked away amongst the olive trees were old stone barns, relics of a more prosperous day. Kalamos was our next destination but as it was a very short distance we loafed about for the morning then decided to sail according to the wind for once. There was a light westerly breeze; we left Kastos making 5 knots on a fine lead heading southeast toward Nisis Dragonera, after 6 miles we gybed and picked up a wind shift that kicked in at 15 to 17 knots. Three rolls in the genoa and we sat on 6-7 knots back towards Kastos where we took in sail in the lee of the island and motored across the channel to Kalamos. 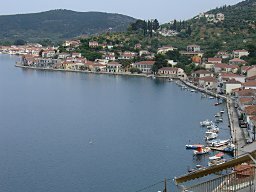 Vathi, a picturesque town at the head of a deep inlet on the Island of Ithaca. At Kalamos we met George, one of two real characters of the inland sea. The other was Babas at Spartochori. On our first visit to Kalamos George was in control, his whistle could be heard a mile away, he stood on the mole and directed us to a berth in the harbour, helped us moor, introduced himself and informed us that he owned the only taverna in the village. Kalamos, a pleasant little harbour where we were captive to George’s taverna. Bareboat heaven. Like Babas, whose voice could also be heard a mile away he too directed us “the Australians” to a berth and helped us moor. I pointed out that our flag only had 4 stars so we were not Australians but New Zealanders. I’m not sure he properly understood. Babas seemed a bit officious so, being the first port of call on our adventure I asked him if he was the harbour master and did he want to see our papers. Of course not he boomed “I built this quay and I also own the taverna over there on the beach”. The next tarverna was 100-metre walk up the hill if you had wanted a choice. On our first visit to Spartochori on Meganisi, Babas had a very busy time finding space and mooring yachts. Yachts were still arriving at 8pm; I think he did good business that night. George too had good patronage at his taverna on our first visit to Kalamos; the harbour appeared full with yachts berthed on the outer end of the mole after the tripper boats had left. On our return to Kalamos 3 days later the scene was one of mayhem. Arriving mid afternoon there was a constant queue of 4-5 yachts at the entrance to the harbour with George in a motorboat directing the mooring of one boat at a time. By 7pm that evening the harbour was jammed packed; I counted 56 yachts. On the outer mole flotilla yachts were moored 3 and 4 deep, in the harbour 6 yachts of one flotilla were rafted off the town quay. George must have thought we could handle a challenge and directed us to moor stern to the outer end of the short jetty extending out from the town quay, he then rafted 8 yachts off us. His taverna was exceptionally busy that night. On our second visit to Spartochori Babas greeted us with his great booming voice, “you have come back” he said, there was no mention of Australians this time, nor was there any mention of New Zealanders. Babas’ harbour wasn’t quite so busy on the second visit but it was fantastic to be greeted as an old pal and treated again to his genial hospitality. 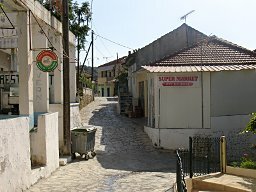 The upper town of Vathi on Meganisi, narrow cobbled streets. This part of the Lefkas sailing area is called The Inland Sea. 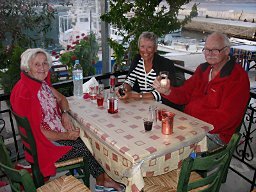 It was now the first of June - the ideal sailing season - and we needed to make contact with Ron and Elizabeth, our friends from England that we had met on a flotilla in the Saronic Gulf - Athens last year and who were now sailing with a flotilla here in the Inland Sea. Text messaging on mobile phones was a great way to communicate. 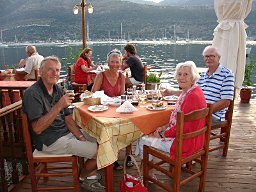 Yvonne and I had motored across to Vasiliki from Kalamos where we at last managed to contact Ron and Elizabeth who were in Vathi going to Frikes then to Kalamos. Hence our early return to Kalamos where we arranged to meet them. 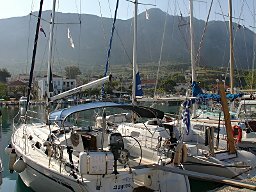 Awoke in Vasiliki to a good blow from the south gusting up to 20 knots so sat out the morning in port waiting to see what the weather would do. By early afternoon the wind had died to 10-12 knots so we motored out into a choppy sea and a dying breeze, just managing to make Ak Lipso on a lead before bearing off to the east and picking up a following breeze that we held on gull wing run to the Meganisi Channel. Finally motoring round to Vathi. Elizabeth, Yvonne and Ron in Kalamos. 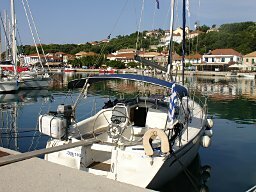 Vathi has a harbour town with tavernas, supermarkets and facilities to cater for the boating tourists. Up on the hill is the real Vathi a delightful town of narrow cobble stone streets one taverna, churches, a town square, a town hall and a wonderful outlook. Not at all unlike its neighbour Spartochori, where too there is a quaint upper town and the 100-metre hill climb to visit the shops was part of the charm. A text message from Elizabeth next morning said they were leaving Frikes so we departed Vathi, motoring to the east of Meganisi we picked up a northerly wind, set the genoa and motor sailed towards the southwest of the island of Kalamos. It wasn’t long before the wind changed to the southwest and built to 17 knots. With 3 rolls in the genoa and the motor ticking over at 1500 rpm we made 6 and a half knots boat speed all the way to Kalamos where we joined the melee at the harbour. Meeting Ron and Elizabeth again was fantastic. Beating at 5-6 knots out through the channel north of Kalamos. With so many other yachts in the harbour George’s Taverna was under pressure, he seated us at our booked table when we arrived and looked after us like royalty. The flotilla company gave Ron and Elizabeth on Asterix, a Sun Odyssey 32 a free sailing pass so we were to have their company and conversation for the next 3 days. For 3 weeks now Yvonne and I had had brief conversations with shopkeepers, spoken a few words with other yachties and enlightened one or two taverna operators on where New Zealand fits in the geography of the world. We had been oblivious to world news insulated from the affairs of home and the rest of the world, and it was surprising how blissful and contented life had become. Palairos on the mainland of Greece, north of the Peloponnese yachting areas. In the morning the mass of yachts in Kalamos harbour slowly emptied, several crossed anchor chains eventually got sorted out no one got too frazzled; we were in no rush so made a late morning departure. A light breeze from the south west carried us around to the east and into the lee of Kalamos Island, after a short burst of motoring we picked up the breeze again and were soon tacking at 5 -6 knots out through the channel north of Kalamos, clearing the headland off Ak Kamilavka and hoping to spring the sheets for a reach to Palairos. No such luck, the wind died and we ended up motoring the last hour. Space in Palairos harbour was at a premium, a flotilla company base had filled the harbour with unoccupied yachts and the inevitable occurred, another flotilla of yachts slowly filled the spaces we had silently coveted for Asterix. Asterix arrived and with the help of the skipper of the flotilla based in Palairos, we managed to squeeze her in between a couple of their yachts. The next two days were relaxed. From Palairos we drag raced Asterix at 2-3 knots across to Ormos Kapali on the island of Meganisi where we rafted up for lunch then motored around to Spartochori for the night. The following day it was back to the north-eastern bays of Meganisi, this time to Ormos Abelike for another raft up, lunch and snorkel before motoring on a mirror sea across to Vlikho Bay and anchoring in the northeast corner. Here our outboard motor decided not to work, Yvonne and I paddled to shore to check out the tavernas and take a stroll then paddled back to Asterix on the way home to find they couldn’t do ferry duties tonight as their dinghy pump didn’t work. But we did borrow their outboard motor for the evening and solved the problem. The evening was warm and the outlook from the taverna over the bay was splendid. Neil, Yvonne, Elizabeth and Ron in Vlikho Bay. All too soon the 3-day interlude with Elizabeth and Ron was over. They needed to re-join their flotilla and we were about to embark on the third and final section of our adventure to the north of Lefkas. Sunday morning the 7th June we bade them farewell and quietly slipped away trying not to disturb the tranquillity of the Bay. Asterix at anchor in the tranquillity of Vlikho Bay. We had arranged with Nikos to meet at the company's yacht charter base in Lefkas about midday. We needed fuel, water, a change of linen, a few things checked on the yacht and wanted to head north early the following day, Monday. Nikos was really obliging arranging the fuel, replacing the linen and spent a long time sorting out a sticking upper bearing on the genoa furling system. After much ado a good dose of CRC fixed the problem. Nikos couldn’t do much about the wayward auto helm or the wind direction instrument that played up but we could live with these minor inconveniences. A blue supermarket plastic bag cut into strips and tied to the shrouds as ‘wools’ solved the problem of wind direction. We took on 84 litres of diesel, this together with the 72 litres we bought in Kalamata worked out to be a consumption rate of 2.1 litres per hour, quite good we thought. 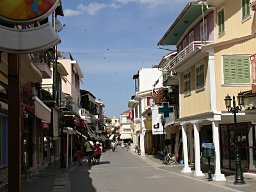 Lefkas, the pedestrian mall in the centre of the commercial area. Most yacht charters start here, either for bareboat sailing or flotillas. The boat check was finished in a couple of hours leaving us time to wander through the town of Lefkas, something we didn’t have time to do when we first arrived 4 weeks ago. The retail and commercial area serviced by the pedestrian mall was attractive and quite extensive. Being Sunday we could only window shop, which was not really a bad thing, we did bookmark a nice taverna that would be opening around 7pm and located a bakery close to the yacht so we could get fresh bread in the morning before we left - provisions. It was a very hot day and back at the yacht we enjoyed our usual drink and nibble before navigating our return to the taverna for dinner.